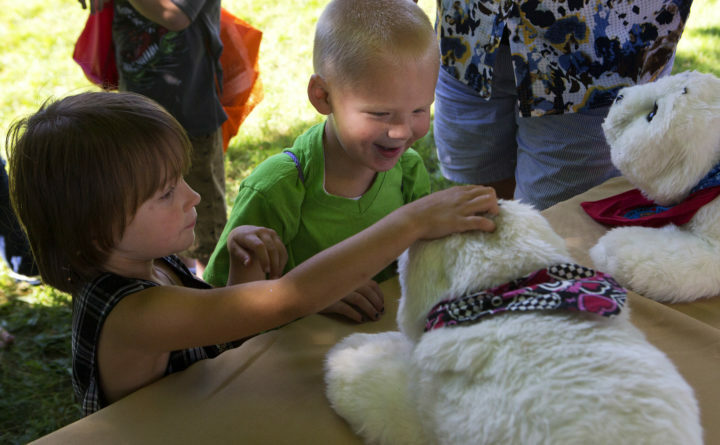 Kids in Bangor's Capehart neighborhood touch a robotic seal during a back-to-school block party in August 2016 sponsored by Community Partnerships for Protecting Children. The child abuse prevention program has operated for the last several years in the Capehart neighborhood and will end Sept. 30 when the state stops funding it. Gov. Paul LePage’s administration plans to stop funding a child abuse prevention program that works directly with at-risk families in individual neighborhoods across much of the state. The Maine Department of Health and Human Services is pulling the plug on the $2.2 million Community Partnerships for Protecting Children program less than two years after expanding it beyond the Portland area and Bangor. In the Portland area, child abuse cases have dropped in the areas where the program is active, and Maine DHHS recently contracted with organizations in western, central and midcoast Maine to set up the program in additional neighborhoods with high rates of child abuse reports. The funding will end Sept. 30. “People’s lives have been changed, and it’s going to be a real loss for a lot of people in these communities if it ends,” said Debra Dunlap, who oversees Community Partnerships for Protecting Children, or CPPC, in seven neighborhoods in Cumberland and York counties. Staff members who work for organizations running the program said they found out about the end of the funding during a regularly scheduled meeting on Feb. 8. Department officials did not involve them in discussions about ending it, they said. Emily Spencer, a Maine DHHS spokeswoman, said the decision followed “an in-depth review” that determined the program duplicated the work of another child abuse program the department funds. In addition, Spencer said, DHHS had planned to use a federal funding source that it later decided it couldn’t use for the program. CPPC works in a handful of neighborhoods that have historically had high rates of crime and child abuse reports filed with the state’s Child Protective Services staff. The program, based on a national model, started in Maine more than a decade ago on the Portland peninsula and soon after spread to neighborhoods in South Portland, Westbrook and Biddeford. It’s since expanded to neighborhoods in Bangor, Sanford, Bridgton, Lewiston and Rockland. Preliminary work was underway to expand it to the Sand Hill neighborhood in Augusta. The community partnerships bring together dozens of local organizations, including schools, law enforcement agencies, social service providers and churches, for regular meetings where they strategize on solving neighborhood problems and find help for individual families in difficult situations — a family facing eviction, for example, or unable to pay a heating bill. In the seven Cumberland and York county neighborhoods where CPPC operates, the partnerships include more than 60 organizations. There’s no other forum that brings together the same organizations, Dunlap said. The funding from DHHS pays for “parent partners” — neighborhood residents who have firsthand experience with the child welfare system — to work with other parents as they’re going through similar situations. They work with parents to get them help from community organizations when they need it and can support them as they deal with the child protective system. The parent partners also work with families at risk of becoming involved with the child protective system. “The parent partners, they can meet with folks and say, ‘I understand what you’re going through because I’ve been there, and it will get better,’” Dunlap said. The DHHS funding also has supported “community hubs,” which are places in each of the targeted neighborhoods where community members can visit, find out how to get help for themselves or neighbors, and pick up donated food. In South Portland’s Redbank/Brickhill neighborhood, a converted trailer houses the community hub, where a community builder Merrie Allen serves as the first point of contact for a family that might need help from a parent partner or other organization. The program got its start in the Portland area in the mid-2000s, and later expanded to to Bangor, where the nonprofit Wings for Children and Families worked to replicate the model in the city’s Capehart neighborhood. The parent partners and community hubs will end without DHHS funding. Funding will also stop for program coordinators at The Opportunity Alliance and organizations like it in Lewiston, Bangor and Belfast. In a Feb. 8 email to those organizations, the acting director of DHHS’ Office of Child and Family Services, Kirsten Capeless, suggested that some CPPC sites could return to “a community grassroots model” in the absence of state funding. But Dunlap said CPPC’s key elements, the parent partners and community hubs, have never existed without state funding. “This has real impact. These programs are specifically designed to help families at risk avoid entering the child welfare system,” said Shawn Yardley, CEO of Community Concepts in Lewiston, which holds contracts with the state to expand CPPC to neighborhoods in Androscoggin, Franklin, Kennebec, Oxford and Somerset counties. Community Concepts and other local groups have been working to establish the program in Lewiston and were at the beginning stages of introducing it in Augusta’s Sand Hill neighborhood. Its contracts will end Sept. 30, according to DHHS. “And to just stop it as precipitously as that, now what do we do with the families we were working with?” Yardley said. Child protective services data show there’s been a drop in the numbers of substantiated child abuse cases in the Portland-area neighborhoods where CPPC has been active, said Tom McLaughlin, a professor of social work at the University of New England who holds a contract with DHHS to evaluate the program’s effectiveness. He’s now working to determine whether CPPC is the factor that made the difference, McLaughlin said. In the cities where the program has taken hold more recently, it’s unlikely there will be any measurable effect due to the premature cancellation, he said. “When you think about any kind of prevention program, to run a program for two years and then say, ‘It’s not working,’ or, ‘The data doesn’t prove it to be true,’ that’s kind of like planting tomatoes and expecting them to be up in June,” McLaughlin said. Spencer, the Maine DHHS spokeswoman, said CPPC is duplicating much of the work of the state’s 13 child abuse and neglect prevention councils. Those councils handle county-wide parent education efforts but don’t work intensively in individual neighborhoods, as the community partnerships do, according to a review of the state contract that funds the child abuse councils. When DHHS first expanded CPPC, it paid for the expansion with the state’s Temporary Assistance for Needy Families, or TANF, grant from the federal government — a funding source that offers the state substantial flexibility to fund a variety of programs for low-income children. In recent years, the department began funding an array of social services with TANF that it had previously funded using state dollars. In addition, the department has paid for after-school programs with the federal grant, justifying the expense by saying the programs meet two of TANF’s four goals: preventing out-of-wedlock pregnancies, and encouraging the formation and maintenance of two-parent families. DHHS’ previously liberal use of TANF funds casts doubt upon its explanation that it now can’t use the money to pay for CPPC.